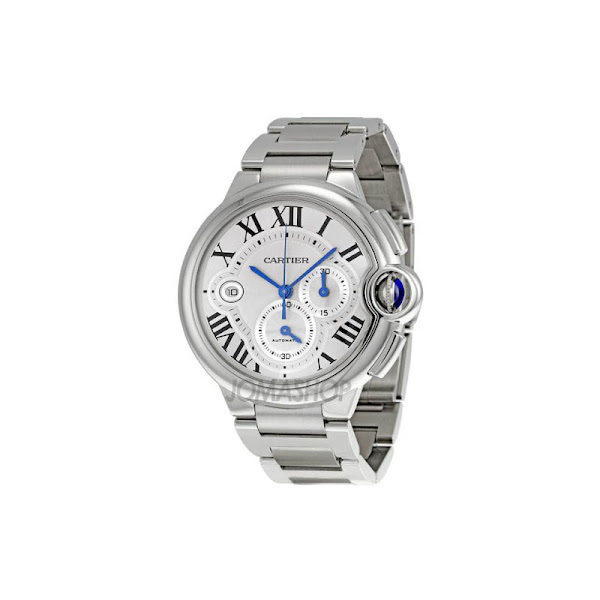 The W6920002 is one of Cartier's Ballon Bleu series model. A handsome Swiss chronograph that is simply a must have for watch-loving men. This timepiece is protected by scratch resistant sapphire crystal with fluted steel crown along with a blue synthetic spinel. This watch has a stainless steel case and bracelet, a fixed stainless steel bezel, a silvered flinque dial with blue steel hands. Coming with skeleton case back along with case diameter of 47 mm and case thickness 15 mm and also deployment clasp. The Cartier, model W6920002 offers a minute markers around the inner rim, a date display apperas at the 9 o'clock position. Chronograph is adorned with Roman numeral hour markers and two sub-dials displaying of 30 minutes and 60 seconds. Powered by automatic self winding movement. Finally, this watch boasts water resistance up to 30 meters/ 100 feet. This Cartier Ballon Bleu's original price is $10,900. You can find an original Cartier W6920002 Watch at the site(s) listed above. However, we don’t guarantee its availability as being listed here simply means that those site(s) has the item in question by the time we wrote the review. The review in this page is written by garnish at Friday, September 30, 2011. The post is tagged as analog, cartier, men, watch.